Hawaii 24/7 has confirmed reports that Guy Toyama, Friends of NELHA executive director, has died. Toyama, 42, finished the Kona Coffee Cultural Festival Miracle Mile fun run Saturday evening and later collapsed. He was rushed to Kona Community Hospital and later airlifted to The Queens Medical Center on Oahu, but could not be saved. “It’s shocking and very sad. He was a great, great advocate of deep water technology,” said Bobby Command, mayor’s executive assistant who serves on the NELHA board of directors. 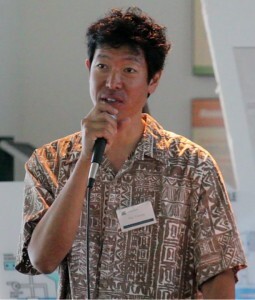 A native of Maui, Toyama was an active member in the community in Hawaii. He was president and CEO of H2 Technologies, a developer of renewable fuels in Hawaii. He had been executive director at Friends of NELHA since 2006. He also served on the board of directors of the Kona Kohala Chamber of Commerce, Kanu Hawaii and also was active in the Hawaii Food Manufacturers Association. Toyama received B.A. in Marketing from the University of Oregon and had more than 15 years experience in advertising, marketing and publishing. Having lived in Tokyo for seven years, Toyama was fluent in Japanese. He is survived by wife, Rika. Services for Toyama are set. I am devastated, he was a friend. We had many a long talk about more subjects than one can imagine. He made a dent in the universe and left a hole that won’t easily be filled. Very sad to learn this . Randy your correct, Guy made his dent and we are all better for it.